God Meets Ball: Is Perfect Good Enough? According to multiple news reports, including www.orangebloods.com the football coach at the University of Texas, Mack Brown, will be forced to retire in the immediate future. Brown has been the head coach in Texas for sixteen years. Fifteen of those years produced winning seasons. In fact, from 2001 to 2009 they won at least 10 games every year. 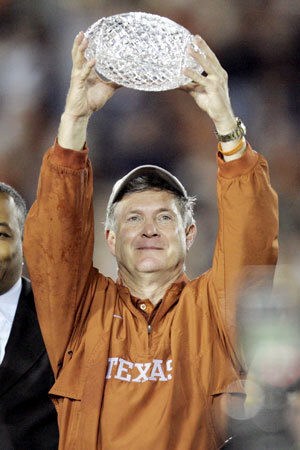 In 2005 Texas won the national championship and came second in 2009. They won the Rose Bowl in 2004 and the Fiesta Bowl in 2008. They also won the the Big 12 title in 2005 and 2009. In almost any college football program in the country this would be a hugely successful era. But Texas isn't "any football program in the country." The Texas football program has enormous financial resources and the administration and fans expect that support and wealth to result in regular Big 12 championships at the least and national championships every few years. Over the past four years the Longhorns have barely broken even in the Big 12 with a 18-17 win-loss record. This article also points out that "Brown [is] the first coach in Texas history to suffer four straight seasons with at least four losses." So turning around a season that started with two unexpected losses and clawing back to a share of second in the Big 12 wasn't good enough to save Brown's job. Different jobs come with different expectations. Sometimes just having a winning record is a major achievement for the team. In other locations beating a traditional rival will make a successful season. But then there are those teams for whom anything less than ultimate success is failure. Each time I hear of a successful coach being fired for not being successful "enough" I reflect on the grace I receive from God. The only "enough" God seeks from me, is a spirit broken enough to recognise my need for God's forgiveness and healing in my life. Plenty of times I get caught up in the pursuit of various "enoughs" trying to please God or earn something from Him. I'm glad God's standards are so much lower that those of football fans around the world, because I'm never enough for God. The only "enough" in our relationship is that God is "enough" for me!